When you have listings that need to be ended on eBay and it is not within eBay’s 12-hour period of time left on the listing, you can easily do it within CrossPostIt. From your Listed (1) section or from the Item Page, you can go to Select an Action (2) and then click End eBay Auction. 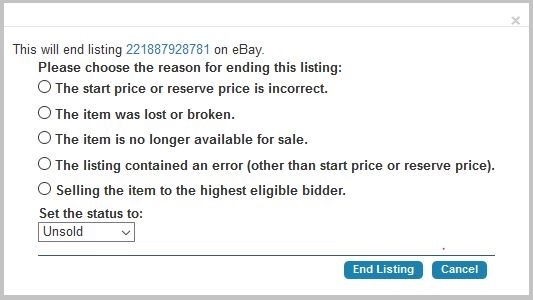 This action will display a lightbox with eBay’s options offered by eBay as to what the reason is for ending the listing. You can also choose what Status you want the item to change to. Once you have Ended the listing, you will see the item and the Status that you set the item.